Over the years, I have heard about the Southern RR Steam Program wanting to use a post-Freedom Train 4449. I asked some of the 4449 guys in Portland about it a few years ago and was told that the SRR steam team knew that they’d never get their hands on her for their program long before she ever came east the first time. One of them suggested that the SRR guys still weren’t prepared for the smooth running that the GS-4 would give, though they later said they’d suspected it might. An old pal is adamant that an SRR-run 4449 would have led to an amazing career after the Freedom Train was done at the start of 1977. I’m inclined to disagree with him about how 4449 would exist today had the SRR gotten their hands on her. Could we assume that 4449 would have gone cold once they decided to get 611 (and later, 1218) out of Roanoke to run? What kind of condition would she have been returned (probably dead in consist of a freight) to Portland? Doyle wouldn’t have stayed in Portland in such a case, so how reasonable would it be that she’d have been running all these years and in the condition she’s in today? SRR/NS uses the GS-4 for the duration of the program but drops the fires in 1994. 4449 then gets towed back to Portland in need of work, nobody is in the area to put serious effort into restoration. Years go by with 4449 probably outside somewhere, while funds are raised and knowledgeable people gather to try to restore her for operation again. So, 21 years later, maybe the effort has gotten somewhere and she’s steaming again, after a really long time of being cold. She’s not Amtrak certified and doesn’t get to take the main on BNSF. She hasn’t gone anywhere under steam since her SRR days. The movie, “Tough Guys” uses 844 instead and Doyle never gets to have a six shooter pointed at him by Burt Lancaster on screen. 4449 has probably had a much more illustrious excursion era career having stayed in Portland since her days with the AFT in 1976-7. SRR and Bill Purdie seemed to change course quite often over the years, constantly searching for something different or better. If memory serves me right, CP Royal Hudson 2389 was too light for the size trains they wanted to haul. Was 610 too rough riding? What was the reason for her being returned to TX? Granted, they probably wouldn't have found a better machine than 4449 unless they had still pursued 611 which probably would have lead to her return to Portland by the early 80's, IMO. You might be right, Rob, but would there be the motivation to get 611 restored if the program already had a fine-running 4-8-4 in the form of 4449? I suggest maybe so once the NS took the reins and the focus shifted to N&W power. But still, I will always think that 4449 returning to Portland in '77 was the best thing that could have happened for all involved. The motivation was Robert Claytor rising to the top at the N&W. 611 was coming out of Roanoke regardless of whether there was a N&W/SR merger or not. At least in the beginning, it was two separate programs running under one management. The decision to restore 1218 was the final nail in the coffin for 2716 and the final transition from the Southern Steam Program to the Norfolk Southern Steam Program. Even as late as 1984, the fall excursion schedule came out with this notice in the remarks "Final repairs on Kanawha 2716 will commence in August as soon as 4501 returns in service, so the 2716 will be in service sometime in mid-1985.". Obviously, 4501 took a bit longer than expected, barely making the close of the '84 steam season and the die was cast soon afterwards to go with the 1218. How 4449 may have changed the timeline and how the NS merger would have affected the engine, your guess is as good as mine, but I think it's safe to say the 611 part would have been unchanged. I think 610's problem was mainly running gear related. They kept having problems from the start, and that's probably what led to getting 2839--again, not an ideal engine for what Southern was operating. I suspect the sheer size of the 610 and wheel arrangement probably gave a few issues here and there also in regards to track layouts and such. Best guess is that Southern was not willing to undertake a total running gear rebuild on an engine they didn't own, or at least have on long-term lease to justify the cost. Heard from someone that the problems were fixed towards the end, but either way, the lease was not renewed. Considering 4501 went down for the count basically the first weekend in 1981 and it took until October to get 2716 up and running, hindsight being 20/20, I suspect Southern wishes they had either 610 or 2839 for the '81 season. C'est la vie. I agree with Kevin but couldn't put it to words as eloquently as he did. Mr. Claytor wanted an N&W engine and 611 was the obvious first choice. IMO, I was always bummed that they didn't stick with 2716. While we will likely never see 1218 or 610 steam again (never say never, right? ), at least we have the prospect of 2716 back in steam in the next few years. IIRC the ferry move of 4449 up the Piedmont gave Bisline and Purdie enough of a taste of super power to stimulate finding a more powerful headliner. After the AFT the 610 was the one available but its long wheel base did prove difficult. And we all know the rest. One question. Given that the N&W J was such an incredible class, I am curious how the 611 sat waiting for a fire as long as it did. It certainly would have been a great loco for the AFT speed plus power. Was the J ever considered for excursion work with the Southern before 82? Simple answer.....under Graham Claytor, Southern was happy with 4501, 722, 630 and occasionally 750. Stanley Crane taking over basically coincided with the 4449 trip, and kinda "opened the eyes" of the company, along with train lengths growing. Both 610 and 2839 were operational before Southern got them--big piece of the puzzle. Minimal investment needed to make them suitable for excursions. 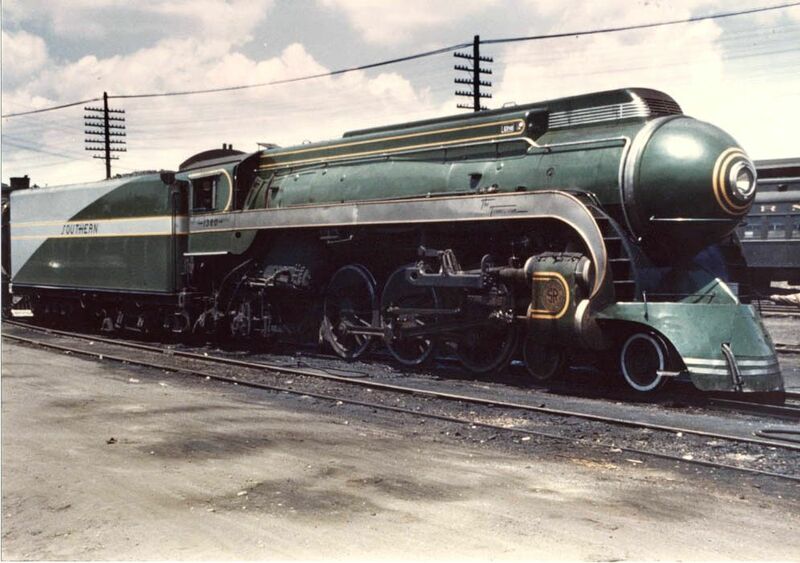 2716 was really the first engine that Southern restored from scratch, and they had already looked at it as Purdie was called in to inspect when the Clinchfield leased it from KRM. On the N&W side, there were several attempts at restoring the J. Ken Miller's book on the Js mentioned one attempt in 1971. Management was not sympathetic, so nothing happened. Once Robert Claytor got control, things started happening within days. An offer was made, at the conclusion of the lease to the Southern, that 2839 could remain on the Southern for an extended period. The offer was also baited to allow the Southern to repaint the Hudson in green and gold. They chose to return her to Atlantic Central owing she was due for a complete retubing. She had bee running on tube extensions from her last shopping in 1959! In fact, to return her to Atlantic Central, a one day extension was granted to run her live from Alexandria to the W&W in Wilmington. 2839 ran one trip for W&W on the Wilmington & Northern on Dec. 11, 1981. Later on she moved with the GM&N 425 to Hamburg, PA. In 1984 she participated in the Grand Opening of the Blue Mountain and Reading, where she suffered with leaking boiler tubes. She was totally worn out by that time. An interesting aside to her tube extensions is the fact that you could actually count about 13 safe ends on some of the superheater flues! "Head for the roundhouse boy's, they won't corner us there"
One question. Given that the N&W J was such an incredible class, I am curious how the 611 sat waiting for a fire as long as it did. It certainly would have been a great loco for the AFT speed plus power. I sure wish Ross Rowland would chime in, but my understand for the AFT was to have NKP berks as the standard power in the initial concept, and 763 (at Roanoke) was considered. I have read that in a few places but I won't say if it's totally accurate, though. Given the engines they did wind up using for the majority of the run (RDG 2101 and SP 4449), I wonder how much tougher getting 611 to run would have been as opposed to the ones Rowland did use? 2101 and 4449 were outdoors since the fires were last dropped, neither in great locations to store dead steam (heck, 2101 was in a scrap yard). 2. How willing would the owners be to let them be used? 2101 was a given, considering where it was before the '30 day miracle' occurred, and 4449 is sort of puzzlement to me as it was in a park at the time but I assume the city of Portland was motivated to be represented across the country (especially since they didn't have to actually do anything but allow the locomotive to be pulled out of Oaks park for a couple of years, max). 2839 ran one trip for W&W on the Wilmington & Northern on Dec. 11, 1981. Good to see you posting again. Slight correction on the date, December 10, 1982. Here is 2839 at the Marshallton shops summer of 1982. Jeff, thanks for the kind words and the date correction. I went on the date by memory, big mistake, my memory went south with my hair! I am attaching a photo from the morning after. We were kept at Greenville, DE overnight on the W&N as the yard was closed. A snowstorm gave us a good bit of snow for our return to W&W the next morning 12/11/82.